A couple of people have asked, and the answer is, I am not taking part in Somerset Open Studios this year. 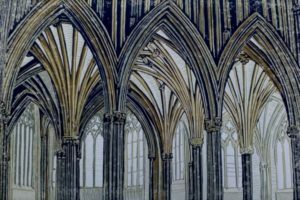 However, the Somerset Guild of Craftsmen will be venue 171 and will be showing work by Guild members Pauline Rook, Chris Kampf and Sue Sinclair. Pauline Rook, Photographs of Somerset Life. Specialising in portraiture, Pauline is well known for her rural documentary work. Chris Kampf, Metal Sculpture. Based on natural forms, Chris’ simple interpretation of leaves and buds in steel, stand out well in a garden background. Sue Sinclair creates kiln formed pate de verre and calst glass. 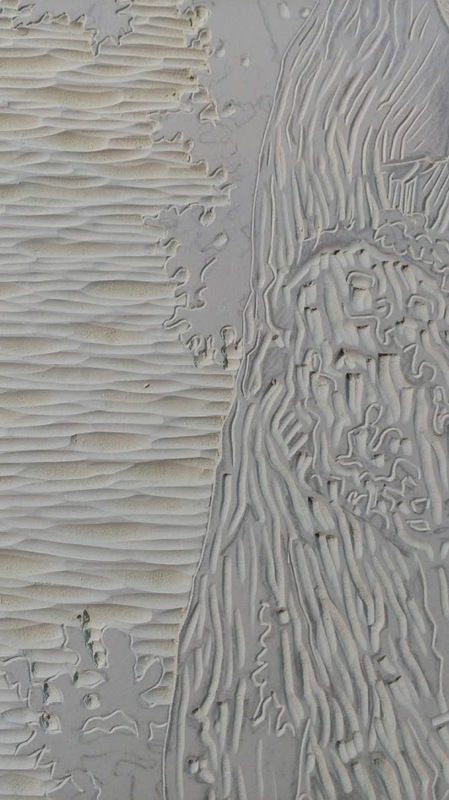 She is inspired both by the colours of nature and her background in archaeology. My own studio is much more mobile, so is not suited to be a venue. I’ve managed to reduce my equipment down to a few boxes and I am planning to move around in the next year, hoping to get out and about, around Somerset and the South West. I may take part in a local Christmas Fayre, more about that when I have details. I plan to do a workshop in Wells next year. Probably just one. I may do an occasional art/craft fair. 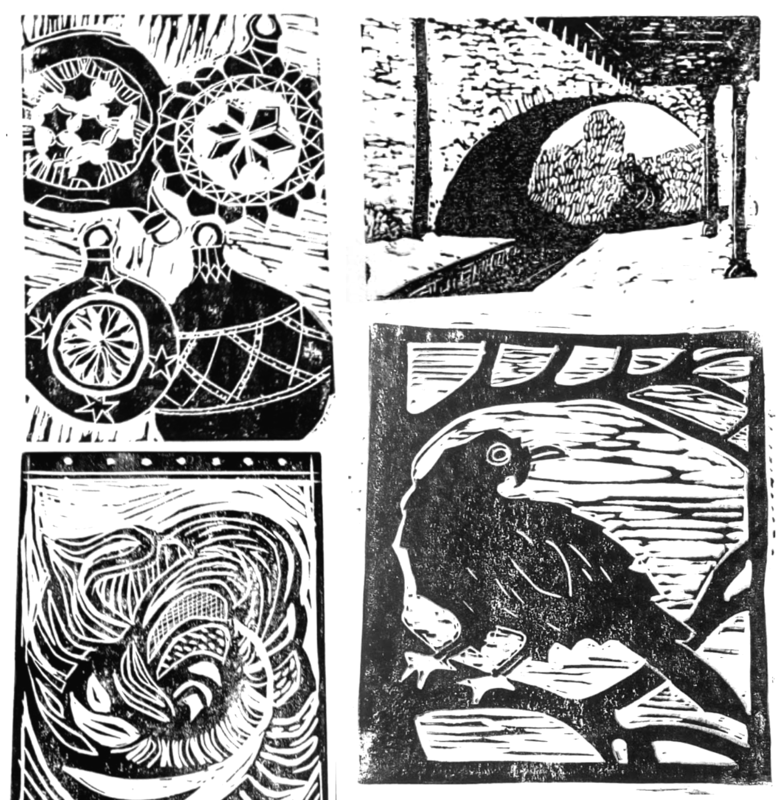 I plan to focus on printmaking, mainly reduction linocut prints. I’ll be running a one day “Introduction to Linocut” workshop at the Somerset Guild of Craftsmen gallery, in Wells, on Saturday 11th August 2018 from 10am to 4pm. It is the only workshop I will run this year and will be limited to a maximum of five participants. 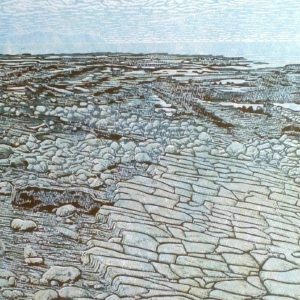 As a beginner’s workshop the focus is on helping you to get started and giving you enough information and experience to carry on with linocut after the event. I’ll be showing you a method you can use at home, without the need for a press or too much expensive equipment. 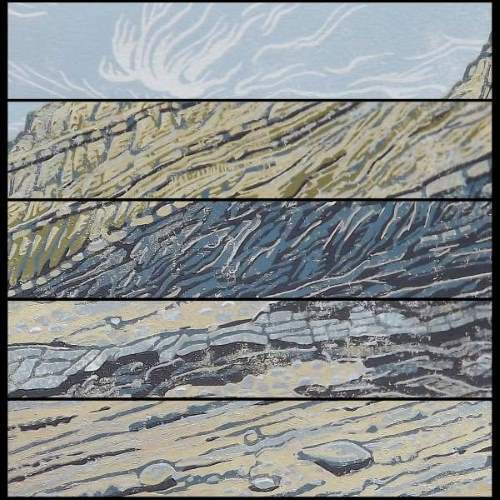 The workshop will include demonstrations followed by practical hands-on experience and experimentation with tools and techniques to create your own unique linocut print. Mark-making is incredibly important in linocut, so there will be time to learn on a practice piece before moving onto working on your design. The tools are sharp, so I will teach you about safety too. I always like it when people bring their own ideas/subjects to the workshop. It is amazing how diverse people’s interests are and it always makes for some lively conversations during the day. If you have any questions about the workshop then please send a message via my contact form or ask for more details at the Guild shop in Wells. Booking is through the Guild (Telephone 01749 671112). It is £55 per person. The next workshop after this one will be in Spring 2019 and will run over a number of weeks. More information on this later. 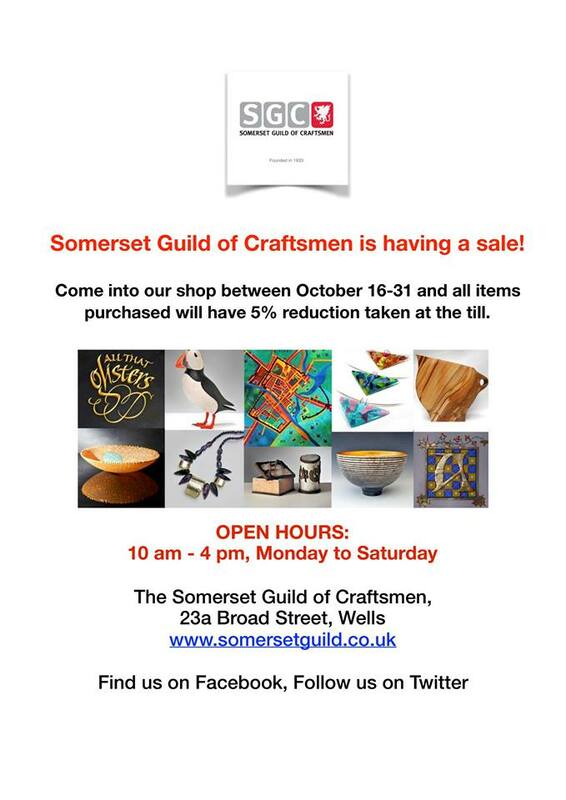 There’s a sale on now, at the Somerset Guild of Craftsmen gallery in Broad St, Wells. From now until the end of October everything is 5% off, including my linocut prints. If you visited the gallery during Art Weeks and were thinking about buying a print, there has never been a better time to buy. Somerset Art Weeks 2017 festival has finished. It was the first time I’ve taken part and was an interesting experience. 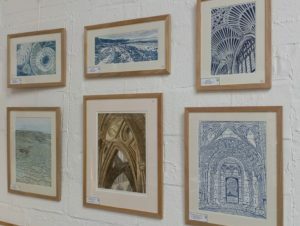 I spent most of my time at the Somerset Guild of Craftsmen’s gallery where my work was part of the “Paper Prospects” exhibition, so I’m afraid I didn’t get out to see any other venues. 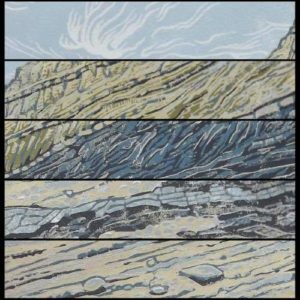 I made some new work specially for the Prospect theme, joining the many artists who have created work inspired by the landscape at Kilve Beach. I’ve been intending to extend my choice of subjects for some time. While I was at the gallery I was working on a linocut of an ancient sweet chestnut tree that I saw at Nynehead near Wellington. I didn’t manage to finish it during the two weeks. I’ll add it to the gallery on my website as soon as it’s done, so you can see the results. The Family friendly “Have a Go” event was lots of fun. I’m very grateful to St. Cuthbert’s Mill for the idea and for providing the paper too. 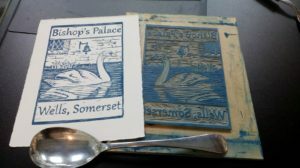 I created two ready cut lino blocks so that people could try printing on St Cuthbert’s lovely Somerset paper. It was a popular event with some very enthusiastic participants ranging from three years old to quite a bit older. I interpreted “family” very openly to mean “anyone at all.” I will do a rerun of the “Have a go” event sometime, perhaps at half term. Although the Paper Prospects exhibition is now finished, my work remains on display at the Guild alongside craft items from all the Guild’s wonderful makers. We are getting ready for the Christmas rush, so you know where to come to do all your present shopping! We are open every day except Sunday, from 10:00 till 4:00. I hope you enjoyed the Art Weeks. My linocut prints are currently on display, until 8th October, at the Somerset Guild of Craftsmen gallery in Wells, as part of the Somerset Art Weeks festival 2017. 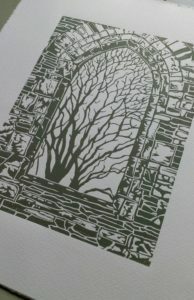 I’ll be there most days, working on a linocut, so please do call in. My Multicolour Linocut Print Workshop is on next week, on 23rd and 24th August 2017. Booking is via the Somerset Guild of Craftsmen’s gallery/shop. I’ll be running a Multicolour Linocut Workshop on 23rd and 24th August, from 10am to 2pm each day, at the Somerset Guild of Craftsmen’s gallery in Wells. Contact the Guild Gallery (01749 671 112) for details and booking. The cost of the workshop is £70 per person, maximum four people. I’m running a multicolour linocut print workshop, on Saturday 13th May 2017, at the Somerset Guild of Craftsmen’s gallery in Wells. 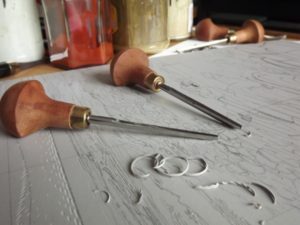 This is a follow on from the Linocut for Beginners workshop that I run. The focus is on learning more advanced registration techniques and processes for making multi-colour prints with accurate registration at home, without the need for a press. It will not focus on mark making or cutting. The aim is for each participant to cut two blocks and use these to make a two colour print. 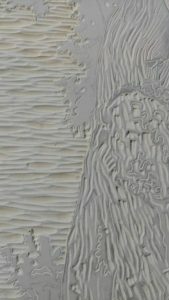 The technique used will allow you to make prints with more than two colours, as many as you want. All tools and equipment required are provided for use on the day and you will be able create your own unique 2 colour print. There is a maximum of 4 participants to ensure individual attention. 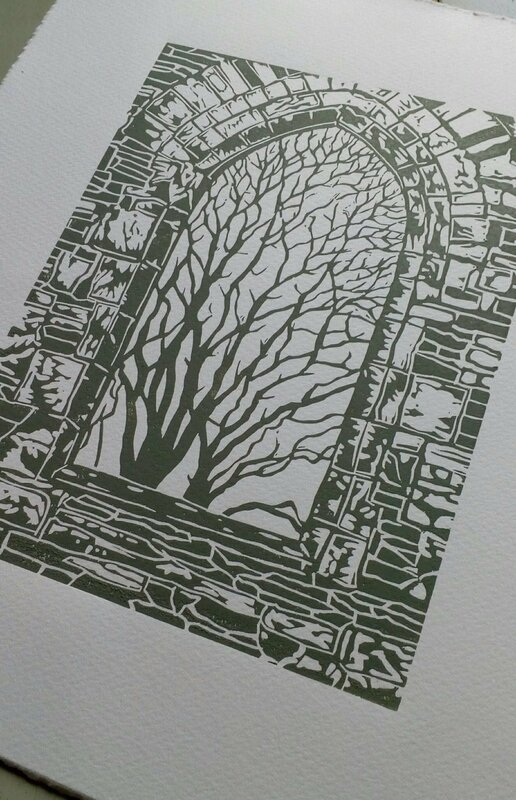 My latest print is a monochrome linocut print of a Bishop’s Palace window in Wells, Somerset, printed on St Cuthberts Mill’s Somerset paper. The Bishop’s Palace is a medieval palace that has been home to the bishops of Bath and Wells for over 800 years. St. Cuthbert’s have been making paper at their mill just outside Wells since the 1700’s. I turned up fairly recently and am now making prints of historic local subjects on beautiful local paper. As ever, this image is available in the form of a greetings card and the original will soon be available in galleries. 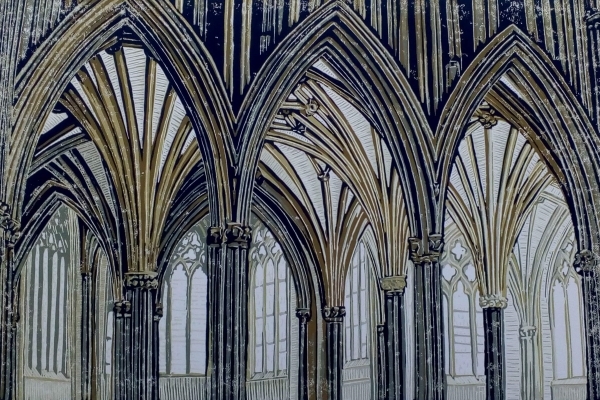 I recently finished this linocut print of the view through the Retrochoir to the Lady Chapel in Wells Cathedral. 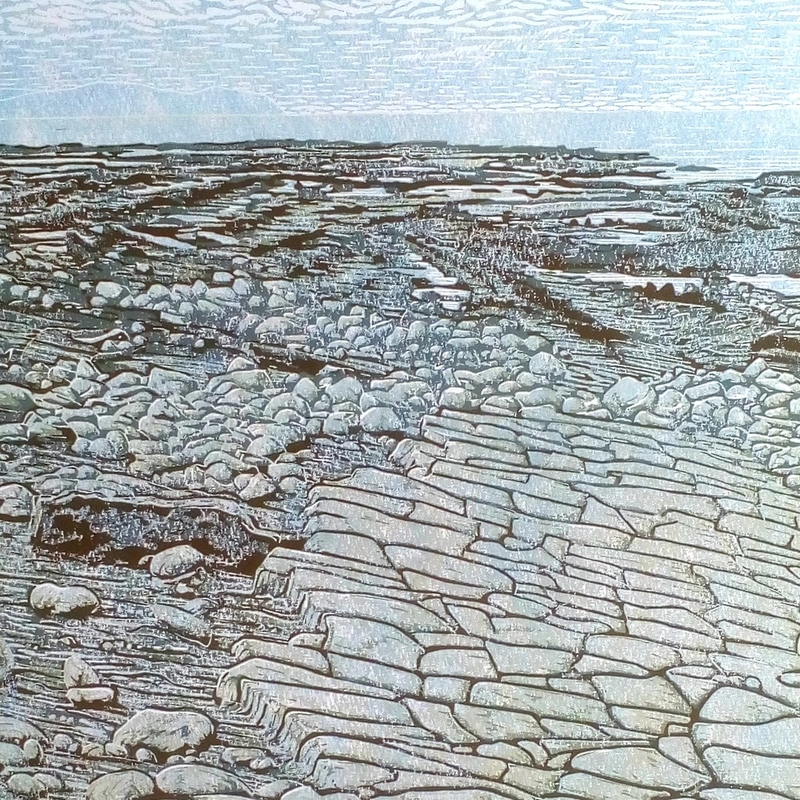 It is a 20 x 30cm, five colour, reduction print. I haven’t decided yet how many of the 14 prints will make it into the edition. In case you are wondering what a retrochoir is, it is just a name for the space between the high altar and the chapel behind it. Wells Cathedral has a particularly beautiful one. This print will soon be available for sale, on my website and in galleries. At the moment it is still drying. However, it is already available in the form of a greetings card, at the price of £2.50 from the Love From The Artist website.